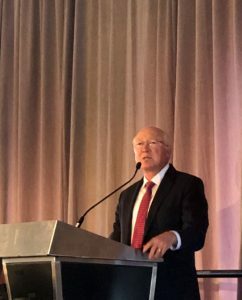 Former Interior Department Secretary Ken Salazar said he disagreed with the legal arguments and theories presented by climate lawsuit plaintiffs around the country, including the lawsuit in Colorado. Salazar spoke to members of the oil and gas industry at the Colorado Petroleum Council event last week. U.S. Deputy Secretary of the Interior David Bernhardt and American Petroleum Institute President & CEO Jack Gerard joined Colorado’s former attorney general in addressing the recent trend in climate litigation and whether courts were useful venues for debating environmental policies or if the issue should be left to the legislative and executive branches. “[I]in terms of environmental litigation which I know many of you are facing, we obviously have some lawsuits in several parts of the nation including here in Colorado around the issue of oil companies and climate and whether or not oil companies under a variety of theories including nuisance theories, are responsible for all the things that have gone on in climate,” Salazar said. In April, the City of Boulder, Boulder County, and San Miguel County filed a lawsuit against ExxonMobil and Suncor with the assistance of Earth Rights International, a Washington, D.C.-based law firm, adding a civil conspiracy cause of action when they refiled the lawsuit in June. “I don’t agree with those who take those positions into the courts,” he continued, adding that climate plaintiffs—cities and counties—are looking for a “framework” to address what they believe is a critical issue, looking to the courts, and that the trend for similarly crafted litigation will continue unless Congress takes a more active approach to the issue. The Colorado lawsuit faces a venue challenge, having first been filed in state court. Similar climate lawsuits brought by the cities of Oakland and San Francisco were dismissed in June, with New York City’s lawsuit dismissed earlier this month. Speaking more broadly, Salazar believes that Congressional inaction is at least partially to blame. “I would just add, I think litigation impact is everywhere. One of the greatest gifts I had when I left the United States Department of the Interior as secretary, all of a sudden, my name came off of three thousand lawsuits, and now David and Secretary Zinke have three thousand against them,” he said, noting that litigation against administrations transcends partisan affiliations. Salazar compared the Congressional inability to act and update necessary regulation or addressing the core issues to the recent Supreme Court decision on regulation of internet sales taxation. The agenda-driven litigation has been rebuffed, according to Gerard, because it did not recognize the proper role of each co-equal branch of the government. “I think we’ve got to get back to a sense of recognition of the three branches and each of their respective roles and not try to push, if you will, one particular branch into a space where they really weren’t intended to be,” Gerard said. He admitted that forum-shopping and litigation are just part of the territory as a regulator and that following the law is his department’s best defense. “We have at Interior a relatively low bar. We need to avoid being arbitrary and capricious. That just means we need to be able to explain in a rational way our activities that we intend to do and follow the law. And if we do that, we should win, and that’s my job,” he said. Salazar said Thursday that media accounts of proposed oil and gas lease sales on a mix of private land and Bureau of Land Management parcels east of the Great Sand Dunes National Park were incorrect, insofar as many had claimed the possible development would occur within the park itself. “It’s near the town of Westcliffe. It might as well be, for us in the San Luis Valley, as far as Moffat,” he said, pointing to another nearby city outside the national park’s boundaries. “And yet, somehow, if you look at the media reports, it’s about drilling within the Great Sand Dunes National Park. It is not,” Salazar said. To counter those media narratives, he said, requires energy literacy and getting the facts straight. “And so one of the realities that I think is really important for all of us to get to be literate about energy, so we understand energy issues, but also to know what the facts are, because sometimes people will misstate the facts in order to advance a particular agenda,” Salazar added.